Sadie has a home! - Rocky Mountain Great Dane Rescue, Inc.
Sadie has a home in Eureka, MT. Judith and Jerald are a retired family who live a very relaxed life on several acres of land. 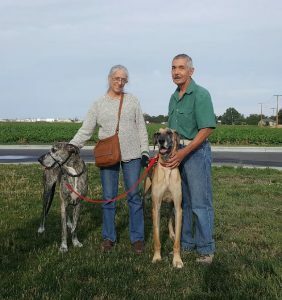 They have a sweet 8 year old Dane named Bernie….whom both him, Judith and Jerald are all feeling the loss of not having their female dane in the home. She passed at the spry age of 13 this past March. Everyone is looking forward to bringing Sadie home. All of the traits and qualities that Sadie has reminds them so much of their last female Dane. They’re looking forward to including this sweet lady on their daily walks and drives into town. Way to go sweet girl!